I recently finished reading "9 Traits of a Life-Giving Marriage: How to Build a Relationship that Lasts" and I thought it was a wonderful book. In these times it seems that more and more people are giving up on marriage and missing out on all the good things that come from the work put into it. Marriage is definitely work and not easy but if you get to that sweet spot where you really do live with your best friend it can be wonderful.The book takes you through 9 traits that you need to come to terms with in order to have a successful marriage. Acceptance, Friendship, Safety, Honesty, Intimacy, Passion, Endurance, Restoration and Expectancy. Each chapter covers a trait by sharing personal stories, practical applications and scripture to help bring insight as to how we get in and out of unhealthy behaviors. It helps you to understand how we can be selfish and what we need to be aware of going forward to change our own hearts which can then change our marriages.I especially liked the parts where Sue explained that our marriages are not like those portrayed in Hollywood movies and TV shows and that is not normal. I think we need to be reminded of that because we are all human and imperfect but those views tend to make us set the bar too high for each other. I would recommend this book for any married couple and even those contemplating it. If I had known some of this before I got married maybe it wouldn't have taken 30 years to get to the good stuff! I recently had the opportunity to review a book, called 9 Traits of a Life Giving Marriage, by Sue Detweiler. I thought the title was perfect- as the book really did deliver on its' promise. 9 Traits of a Life Giving Marriage was a straightforward and honest look at what it takes for a Christian marriage to thrive. I appreciated the vulnerability shown throughout the pages, along with Sue's willingness to share personal stories from her own marriage- the good and the bad. We can learn from each other, and this book had the tone of a wise, older sister, sharing her wisdom out of love, with a desire to see marriages succeed. Each trait has a chapter devoted to explaining the why and how behind it, with practical applications and stories from Sue's own marriage to illustrate. Each chapter closes with a prayer for your marriage. This is a book that acknowledges the need for Christ to be the center of a life- filled marriage. I would recommend this book to newly married couples, as well as those married for many years, healthy marriages, and those that are struggling. If we're honest, marriage is not easy for any couple. Sue Detweiler writes about nine characteristics for every marriage. The book is an easy read which combines biblical truth with practical how-to information. I loved this quote from page 86, "Grace is the balm that brings healing from the imperfections each spouse brings to the marriage. "In the conclusion, she writes,"When you review these nine traits, please do so with the faith that in the areas where your marriage presently falls short, God is able to transform you and your relationship by His power." (page 103)I highly recommend this book. I so enjoyed this book! While I consider my husband and I to have a strong marriage, it was a wonderful reminder of how to center our marriage on Christ. I felt each trait was important and well explained. I wish I would have read this during our first year of marriage, when everything was new and a little confusing. I had many "okay I'm normal!" moments while reading and thinking in retrospect. I especially liked how Sue really took the time to encourage the reader to evaluate his/her relationship with Christ. We get so caught up in a title rather than a lifestyle. I think this has been an excellent reading endeavor, and I will recommend it to all my married and soon to be married friends. Both thorough and concise, this book offers insight and tips for couples seeking a marriage that honors God. I enjoyed the way the author broke down the traits, how problems can manifest if they are neglected, and practical ways for couples to work on each area.Short and easy to read, but full of quality content, the author challenged the way I've applied scripture in my marriage (for example: don't let the sun go down on your anger).I received an advanced copy of this book in exchange for an honest review. Sue's Book deals with different marital issues. She takes on a different perspective entirely. While she offers words of hope and prayers at the end of each chapter, she carefully peels through different hidden areas of marriage. One favorite quote I find interesting is "Acceptance is a conscious choice to receive your spouse as God made him or her". She also shares about being intentional and calls her readers to enjoy the uniqueness of their marriage.This book is good for Book Clubs and Bible Study groups. I love Sue's honesty in sharing her own marriage experiences. This is a great line in the book: "Being the head of your wife isn’t about getting your will done, but seeing that God’s will is done in your home." Such a powerful statement in an area of scripture that tends to be misinterpreted all too often. This book is both encouraging and real, and would make a great gift too! Practical and biblical advice whether married, or preparing for marriage. As someone who is not an avid reader, and find it difficult for a book to keep my attention, I must say that this book is so easy to read, and so insightful on having a Godly marriage. I love the way Sue writes, she is a breath of fresh air for someone who typically does not enjoy reading. I highly recommend this book for anyone that is considering marriage, or has been married for a number of years. In this new book by Sue Detweiler, she says, "Wisdom from God brings peace and assurance to your heart." This book is full of reminders and revelations that are helpful in all relationships, especially marriage. We need to take time to consider the other person's opinion and that will help the conversation. Get this book and read it. You will be glad you did. Sue Detweiler has written a beautiful, concise handbook for marriage. "9 Traits of a Life-Giving Marriage" should be mandatory reading for every newlywed couple, brought out for reference again and again! 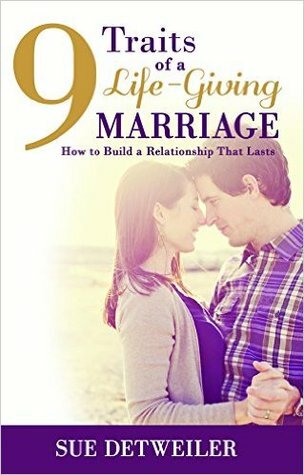 Truly a delightful, uplifting read with a spirit-driven plan to sustain both partners in a life-long marriage! Excellent, insightful, and practicalOnce I started reading it, it was hard to put down this eBook. I read it in a matter of 4 reads. I sensed truth, authenticity, and good counsel in what I read. And I appreciated its Christ-centered approach/premise. Outstanding. I enjoyed Sue's book. It's easy to read and digest. Sue uses personal examples. She's real and honest. She uses material and research that can be helpful. And I love that each chapter ends with a prayer, which helps implement the material she provides.